Back to Lysaker on the "Homefleet Ships starting with L" page. When named Solskin - see Post War details below (from George Robinson of Riversea International). Delivered in Nov.-1919 from NV Scheepsbouw Mij. Farmsum, Delfzijl, Holland as cargo vessel Delfzijl to NV Gebr. van Udens Scheepsvaart & Agentur, Rotterdam, 898 gt. Sold in 1920 to Union Maritime Belge SA (M. J. van der Eb), Antwerp, Belgium and renamed Ramscapelle. 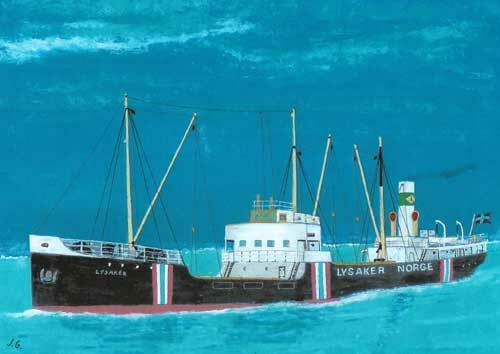 Sold in Sept.-1924 to Ludvig Lorentzen, Lysaker (near Oslo), renamed Lysaker. 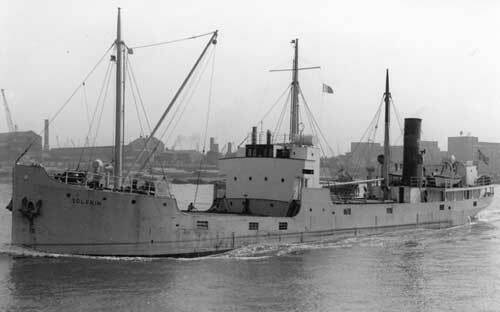 According to A. Hague, Lysaker sailed in Convoy ON 12, which left Methil for Norway on Febr. 13-1940. At the beginning of March we find her in the original Advance Sailing Telegram for Convoy HN 17 from Norway to the U.K., bound for West Hartlepool with pit props. A. Hague now has her returning to Norway later that month with Convoy ON 22 - several Norwegian ships took part in all these convoys. J. Rohwer ("Allied Submarine Attacks of World War II") lists this ship (giving her 909 gt) in a convoy with Irmtraud Cords, Ortelsburg and 7 escorts, attacked by the Russian submarine SC-422 (Vidyayev) on Aug. 24-1942 (70 08N 30 49E), but torpedoes missed. Sunk by British aircraft on March 23-1945 (Mosquitoes from Squadron 143), in Sandshamn, Sunnmøre when on a voyage Tromsø-Oslo with general cargo. See the link below to the Banff Strike Wing webpage for further details on this air attack. Wreck taken over by Statens Krigskaskoforsikring in 1945. Raised in 1946 by Fladmark Bjergningsselskap, laid up in Ålesund. Sold "as is" in Dec.-1946 to Erling Sannes, Bodø, towed from Ålesund to Bogens Verft & Dokk, Ofoten for repairs in June-1947. Sold in 1947 to H. Angell Olsen, Harstad, still undergoing repairs. Sold in March-1948 to A/S Solskin (Holger Fischer), Oslo, still being repaired. Re-entered service as Solskin on Apr. 24-1948. Sold in June-1958 to A. Gandour, Beirut, Lebanon. Broken up in Tripoli in 1969, according to Lloyds Casuality Returns Dec.-1981. Marine News of Oct.-1979 gives the year as 1974. Sorties Flown by Banff Strike Wing - Scroll down to March 23-1945. (Pre war and post war details received from T. Eriksen, Norway - his source: Article by Dag Bakka Jr. about Ludvig Lorentzen in the Norwegian magazine "Skipet" 3.2001). Other ships by this name: Ludvig Lorentzen also had Lysaker II; built 1922 as Emilie Dunford, purchased by L. Lorentzen in 1932. This ship became Samev in 1939 (follow link for more details on this ship). Lysaker III was built 1923, 1167 gt - departed Rekefjord on Febr. 28-1936 with a cargo of ore for Rotterdam but was never seen again. The only trace of her was a lifeboat seen on March 13. Also, Haugesund very briefly had a steamer by this name during WW I. This ship had been delivered in March-1899 as Bardistan for Anglo-Algerian S. S. Co. (F. C. Strick & Co.), Swansea, 2013 gt. Sailed as Lysaker for A/S Hekla (Mail & Holby), Christiania later that year. Purchased by D/S A/S Gesto (B. Stolt-Nielsen), Haugesund in June-1915, but struck a mine and sank only a week later, on July 6, near Danilow in the White Sea on a voyage Blyth-Archangel with coal. 7 died, survivors were picked up by a Russian vessel ("Våre gamle skip" and Charles Hocking - ref. My Sources page).